Elevator accidents, though they are decreasing in number, are still raising questions about the safety of infrastructure, the quality of maintenance and accountability. Governments across the nation are looking to ensure that tragedies - which range from people dropping down empty shafts to people getting trapped inside elevators for days - never happen again. Yang Chaolin, 43, and Yang Yong, 44, an uncle and nephew from Shenyang, Northeast China's Liaoning Province, plummeted down an elevator shaft on the night of February 3, 2017. 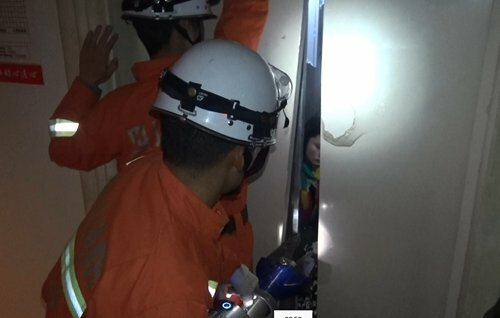 According to the Peninsula Morning Post, a newspaper in Dalian, Liaoning Province, after celebrating Yang Chaolin's father's birthday, the pair stepped into the shaft after the door opened on the 28th floor and fell until they hit the top of the elevator car, which was stuck on the third floor. The elevator had malfunctioned before they stepped in, sliding from the 28th floor and getting stuck on the third floor. Rescuers who arrived at the scene after they received a phone call from the family found the pair were already dead. The tragedy was not only a blow to the family, but shocked and worried people across the country. "A total of 48 elevator accidents happened in 2016, killing 41 people, a drop from 58 incidents and 48 deaths in 2015," said Jia Guodong, Vice Director of China's Special Equipment Safety Supervision Bureau, at a seminar on the elevator industry held in Shanghai on January 19. While China's elevator death rate of 0.12 accidents per ten thousand elevators is similar to that in developed countries, the cause of accidents is still important, as around one-third of the world's elevators - about 4.9 million - are located in China, the Procuratorate Daily reported. "Over 80 percent of accidents are due to poor maintenance or repairs," Peng Jinsheng, Director of the Beijing Elevator Commerce Committee, was quoted as saying by the Procuratorate Daily on February 8. National regulations say that elevators should be cleaned, lubricated, adjusted and checked once every 15 days, however the Procuratorate Daily reported that this rule is rarely followed. Procuratorate Daily reporters found that elevator problems are often ignored by building managers even when complaints are made, and expired or forged inspection certificates were found in some elevators. A report compiled in August 2014 by the Prospective Industries Institute, a civil organization specializing in market data surveys, in August 2014 claimed that in order to cut costs, building owners often outsource maintenance to third parties who usually charge around 4,000 yuan ($667) per year, much cheaper than the price offered by manufacturers. These "bargain" maintenance deals often lead to poor safety. Furthermore, regulations on the installation and maintenance of elevators stipulate that it is forbidden to install, alter, maintain or repair elevators if one doesn't have the relevant license. But many unqualified installers have slinked into the elevator industry, becoming a significant cause of accidents. In January 2016, a resident of Xi'an, Northwest China's Shaanxi Province surnamed Wu was trapped in a malfunctioning elevator for more than 30 days without food or water due to the negligence of maintenance staff, Guangdong-based sounthcn.com reported. The elevator she was riding in her apartment building got stuck between floors, but when repairmen checked on the elevator, instead of opening the doors to check if there was anyone inside - as the relevant regulations say they should - they simply shouted through the door. After hearing no response, they turned off the power and left it closed. When repairs began on the elevator on March 1, the body of the 43-year-old woman was discovered. Facing these problems, governments have put forward a variety of ways to provide accountability and improve the management of elevators. The government of Baoji, Northwest China's Shaanxi Province, started to offer elevator liability insurance from November 1, 2016, covering all sorts of elevators in the city. The government offers the basic premium while owners pay 80 yuan every year, with the coverage providing up to 3 million yuan in compensation. In Qingdao, East China's Shandong Province, the local government publicized newly revised regulations on elevator safety and supervision on its official webpage on February 8, canvassing public opinions. The rules stipulate that elevators in schools, kindergartens, hospitals, supermarkets, parks and other public places should be equipped with video surveillance systems. In the case of an accident, rescue work should be coordinated by police officers, the fire department and the local quality supervision department. Elevator maintenance units are also required to set up 24-hour hotlines and dispatch rescuers to the scene in a timely fashion.